528 pages | 6 Color Illus. | 118 B/W Illus. 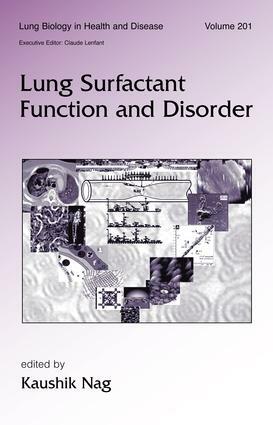 The only source to describe the lung surfactant as a complex membranous system, this guide analyzes lung surfactant function from the aspects of molecular biology, biophysics, membrane science, and surface and interface analysis and reviews the latest basic and clinical issues relating to lung disease and (dys)function. "…the book is comprehensive and covers all major areas of surfactant study." "…delves into the depths of the biology of pulmonary surfactant in respiratory diseases. The editor's intent to combine current observations regarding the biochemistry of pulmonary surfactants and the biophysics of surface tension phenomena is well-executed in this book."